It is only five days until Caplin Day 2013 so there is no better time to revel in the cuteness that was Caplin Rous. Of course Caplin was cute all the time, but he was especially cute when he was wearing a costume. That is why we are celebrating Caplin Day with a Costume Contest this year. 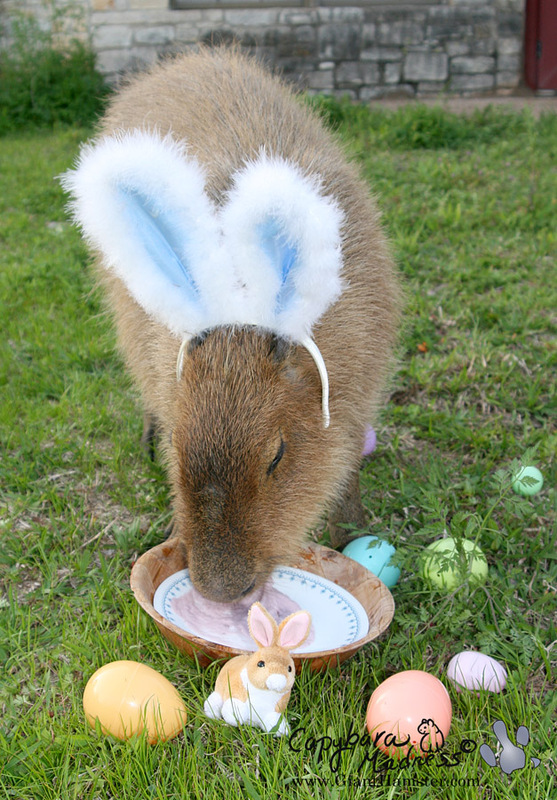 I hope these photos of Caplin dressed as an Easter Bunny will inspire more people to enter the contest and will help to keep Caplin Rous, the World’s Most Famous Capybara, alive in our hearts and minds. 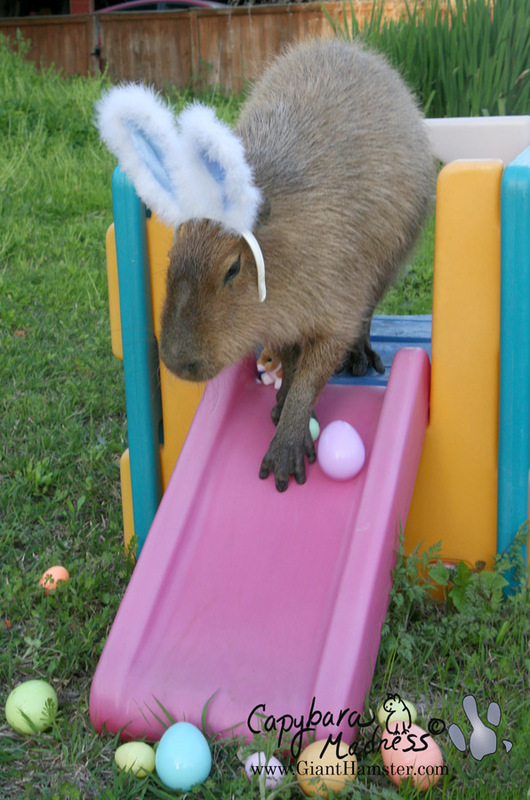 Melly cannot teach me to go up on that thing much less come down the slide. I suppose this is one of the many things that made Caplin Rous so special. Excuse me, you have a rabbit on your head. 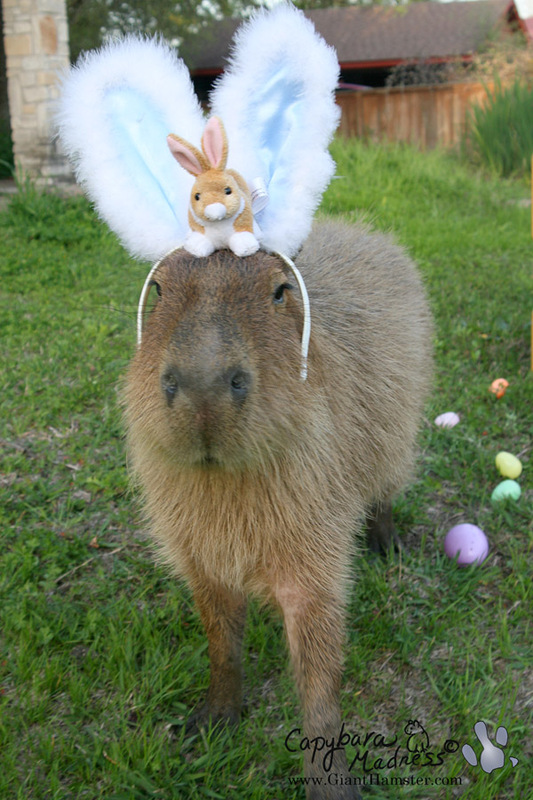 I won’t wear those ears either, let alone let a tiny plush rabbit sit on my head long enough for a photo. That’s just crazy. How did Caplin Rous manage to be so cute all the time? Dignified, yet cute. I honestly don’t know how he did it. He’s got rabbit ears and a tiny rabbit on his head, but he still looks noble. That nose is too cute to even pretend to be a rabbit. 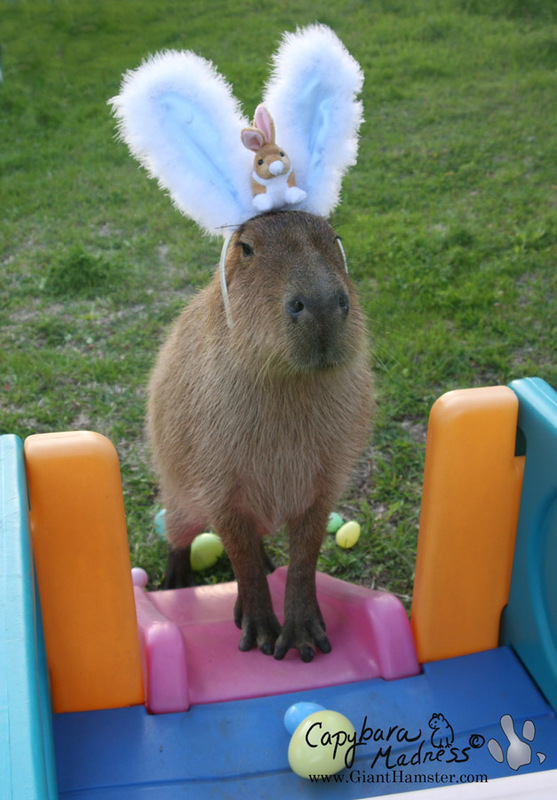 Not that rabbits aren’t cute, they’re just not capybara cute. Remember, we celebrate Caplin Day on July 10th by eating popsicles and/or yogurt and/or yogurt popsicles, in memory of Caplin Rous. Those were his very favorite foods. In the photo above, he is eating his favorite flavor, blueberry. 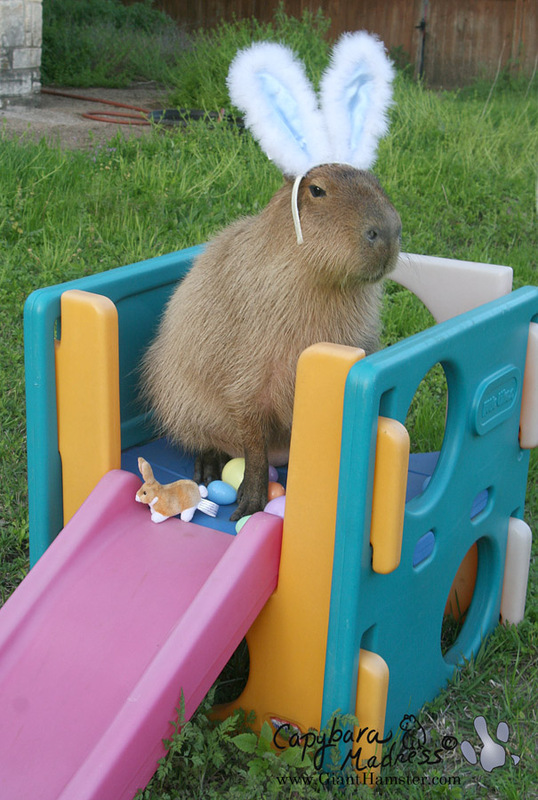 Caplin was the most special capybara. It’s impossible to say too much about him, everything will be not enough. There’s something in common between Caplin and a bunny…..the cuteness. But don’t try to imitate, you all will fail. Coz no one can be that cute. What a very sweet boy and so photogenic. 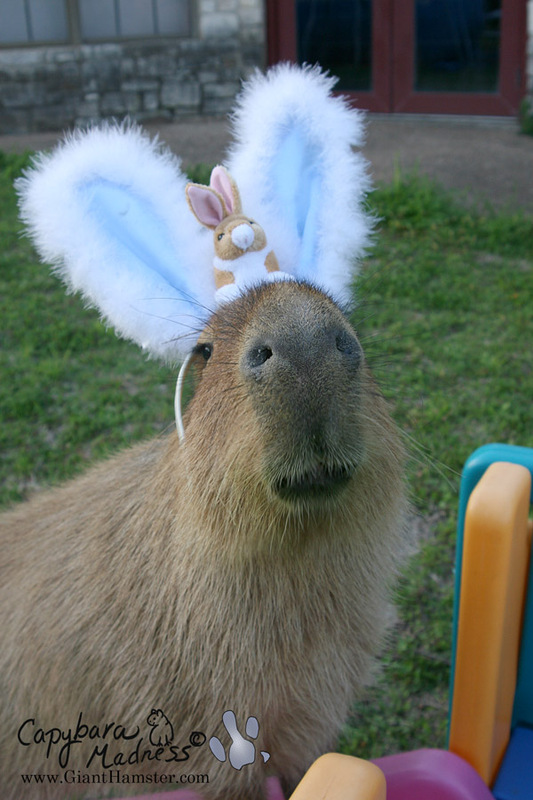 Wracking my brains for a suitable costume to dress up my plush Super Capy for the occasion. Also, time to hit the grocery store and begin stocking up on popsicles! Gari — What’s your favorite flavor? Butternut the GP also loves popsicles and I know he will enjoy one in honor of Caplin. Let’s not give Gari a complex. He’s pretty cool too.